Meet my new favourite thing. IN THE WORLD. Sweet and sticky Rocky Road Brownie Bark. The easiest recipe ever that makes the most delicious chocolate treat. Does it get any better? 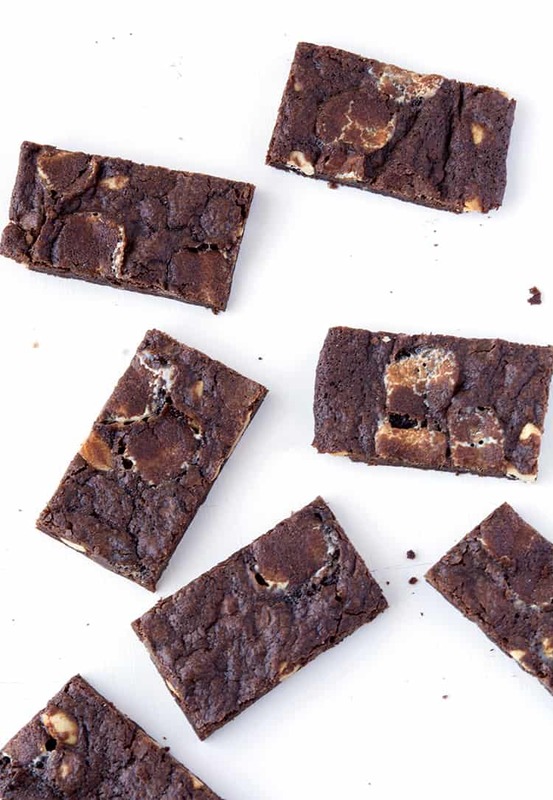 All you need is a bowl and a spoon to make this Rocky Road Brownie Bark. 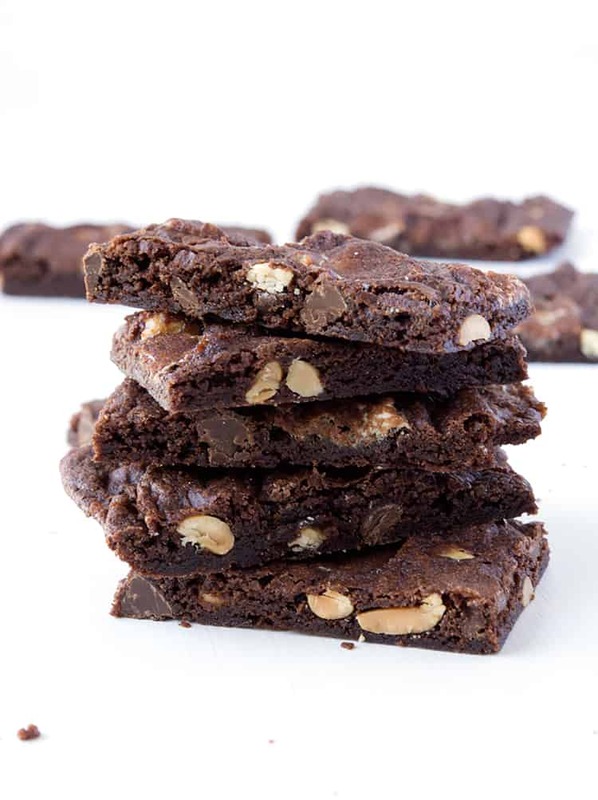 It’s super chewy and sticky with melted mini marshmallows, pockets of chocolate chips and crunchy salted roasted peanuts. 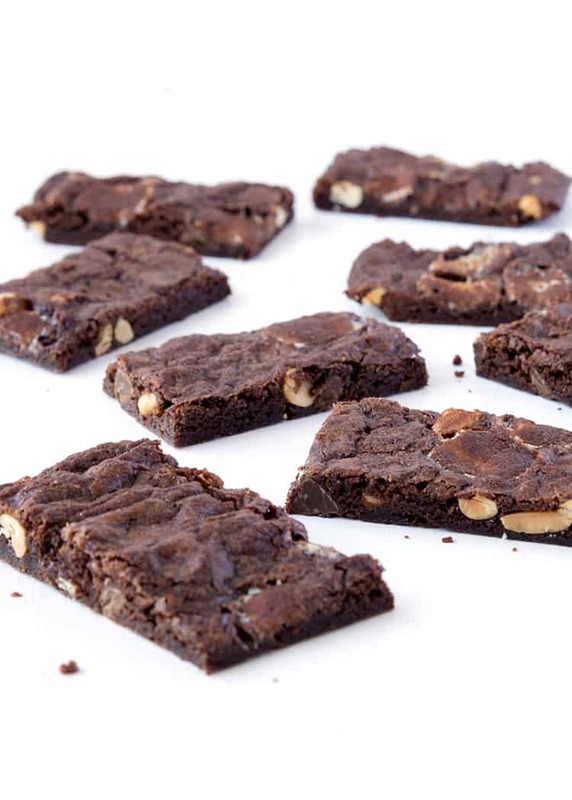 I first made Brownie Bark back in December (remember THESE?). It took me a zillion times to get the recipe just right but when I did, oh boy, I was in h-e-a-v-e-n. So when it came to making a new brownie bark, I wanted one that I could make and enjoy all year long. Enter: Rocky Road Brownie Bark. I’m a huge rocky road fan. There is something about the perfect combination of crunchy nuts, chewy marshmallows and chocolate – lots and lots of chocolate. 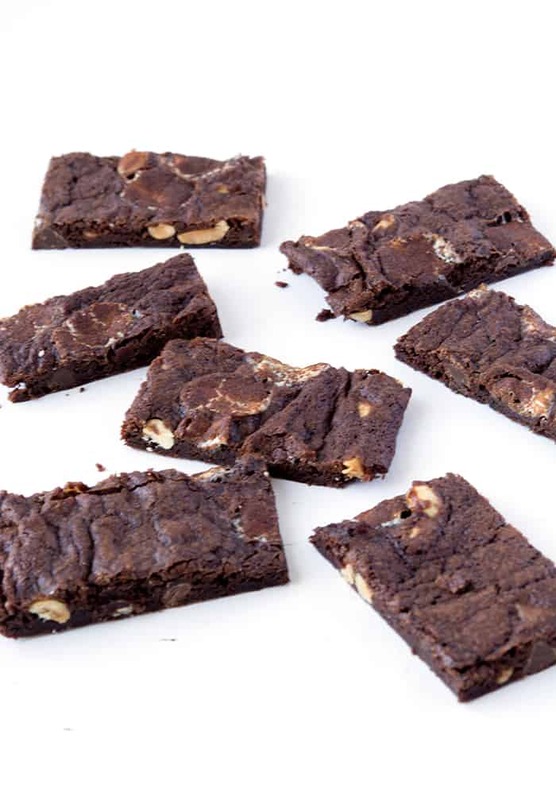 It only takes a few ingredients to create this chocolate brittle, but it is a taste sensation. And it’s the extra chewy texture that gets me every time. 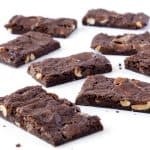 If you have never made or eaten brownie bark before, it tastes somewhat like a fudgy brownie but it has a super chewy texture. 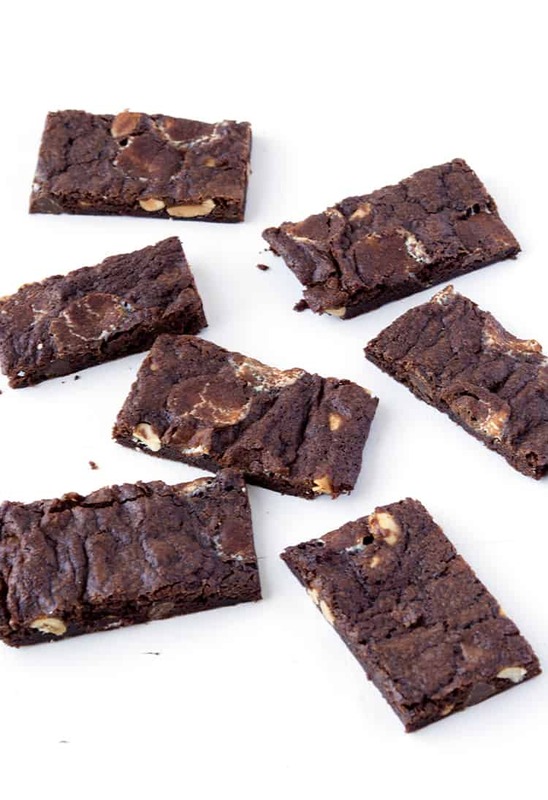 My recipe will give you a chewy Rocky Road Brownie Bark that has crispy, crunchy edges. The marshmallows melt straight out of the oven but once you let the brittle cool, they go extra sticky. You can bake it for longer if you are after something super crunchy. Either way, you are guaranteed one sweet treat. So if you want want to serve your guests something special after-dinner, or you simply want to treat yourself, this is your answer. You don’t need any outrageous ingredients. In fact, you don’t even need an electric mixer. Just mix, dump and bake. Honestly, I could NOT stop eating this Rocky Road Brownie Bark and I’m sure you will LOVE it too! A super chewy Rocky Road Brownie Bark loaded with chocolate chips, mini marshmallows and roasted peanuts. Line an oven tray with baking or parchment paper. Preheat the oven to 160 C (320 F). In a large mixing bowl, add the egg white and sugar and whisk together until smooth, approximately 1 minute or so. Then add your vanilla and mix again. Then add your melted butter and mix again. Sift in your cocoa powder and flour and gently stir until a chocolate batter forms. Throw in your chocolate chips. Finally, add the milk and vegetable oil and stir gently until smooth. Then stir through peanuts and marshmallows. 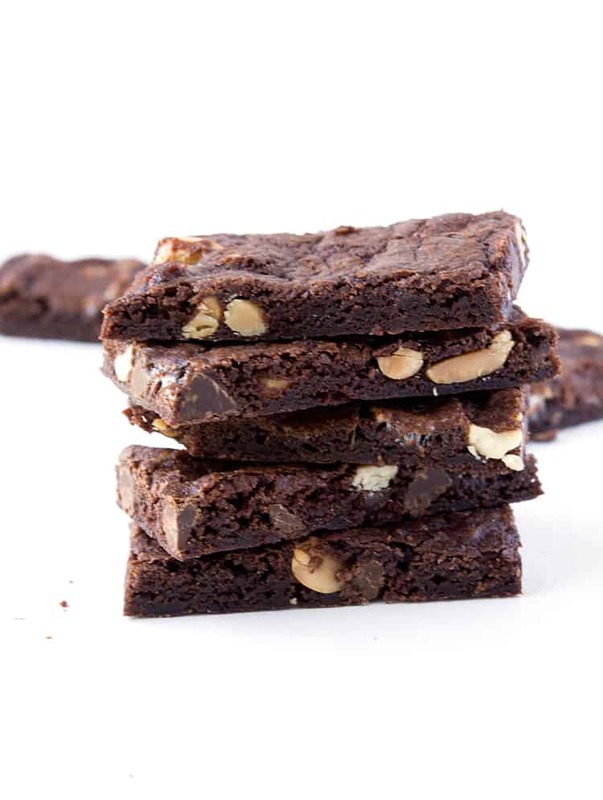 Pour your brownie batter onto your prepared tray and spread out to form a large rectangle. Bake for approximately 15-20 minutes (15 minutes for a more chewy bark, 20 for a more crisp bark). Leave to cool completely. Aww so glad to hear that David! Gotta love a quick and easy dessert – and love the idea of using biscuits and smarties, yum! Hello! What size is an oven tray? Is caster sugar the same as white sugar? Why is the chocolate m&m instructions at the end for this recipe? Hi Meg, thanks for your comment! It really doesn’t matter what size oven tray you use because you can spread the bark out as thin or thick as you like. I just use my regular cookie sheet but it doesn’t go right to the edges. Caster sugar is fine white sugar that is used for baking here in Australia. You can use granulated sugar instead. I’ve updated the recipe, thanks! Hope you enjoy! Tell me about it Kristy! Crunchy, chewy edges are where its at! Yum! I can see why this is one of your favorite things!